Before you answer the question, please consider the man, not just his reputation. Of course, he does share a nickname with a certain loveable blue monster from Pixar’s "Monsters, Inc." But although he is only on loan for 6 months, beware, you may grow as attached to him as you might the big blue furry version. 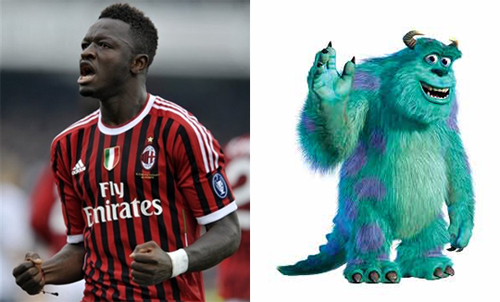 Sulley the man? or Sully the monster? 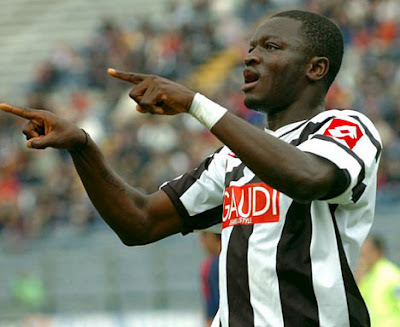 He was born Suleyman Ali Muntari in Ghana and began his youth footballing career with Liberty Professionals. From there he was scouted by both Udinese and Manchester United. After a trial with Manchester United, he chose Udinese. He spent his first year there in the youth team, but made his debut with the first team against our very own AC Milan. The 2007-08 season saw him with perhaps a craving for tea and scones, as he transferred to Portsmouth, breaking a club record transfer fee of £7.1 million. He started in 33 games in all competitions, scoring 5 goals, 6 yellow cards, and 2 red cards, some very colorful stats. But it was more than just numbers. He scored 2 missiles from long range in a single match, and scored the singular goal in a win over… wait for it… Manchester United in an FA Cup match. Kind of the story of his career: big goals in big games, and a card collection that would make any collector jealous. Okay, so he makes poor choices, too. Clearly, the Premier League wasn’t his cup of tea after all, as he left after only one season to join the dark side of Milan. At Inter, he arrived at the same time as Jose Mourinho. Muntari’s transfer was worth €16 million plus bonuses, and he signed a 4 year deal. 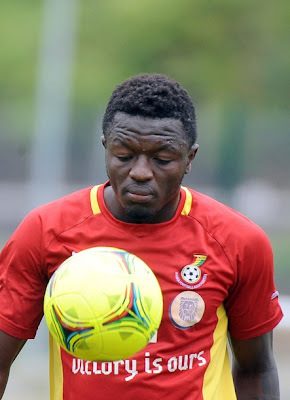 Not only did Mourinho ask for Muntari, but the Ghanaian International found favor with the Special one, earning 33 starts in 36 appearances, where he scored 4 goals and made 6 assists while earning 7 yellow and 2 red cards. The next season opened with a bit of controversy, as Mourinho openly criticized Muntari’s adherence to the Muslim practices of Ramadan, saying that the fasting left him too weak and dehydrated to play. However he still made 23 starts in 43 appearances in all competitions, scoring 2 goals, making 2 assists, and earning 7 yellow cards and only 1 red card. After winning the Scudetto in his first season, he was a part of the treble winning team in the 2009-10 season. 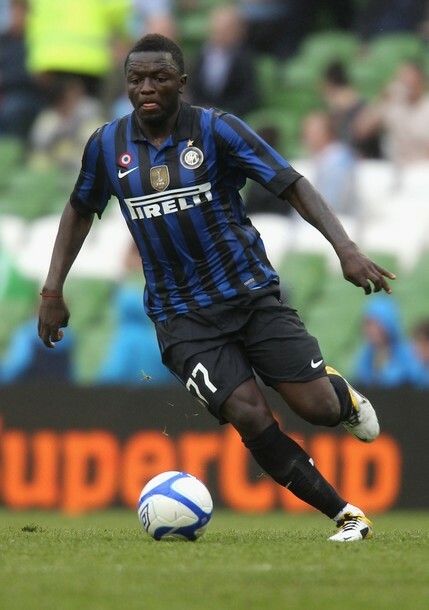 As Inter’s fortunes fell, so did Muntari’s playing time. After only 4 starts in 3 appearances in 2010 under Benitez and Leonardo, Muntari handed in an official transfer request in January, and was subsequently loaned out to Sunderland in the EPL. After only 9 appearances, his loan deal was not extended, and he returned to Inter. His time under Gasperini and Rainieri saw his playing time reduced to only one start in 4 appearances, and so he graciously accepted a transfer deal to AC Milan in January of this year. Whether or not you believe in destiny, chances are he’d already been kicked by Ibra when they played together at Inter, so he quickly fit right in at Milan. It helped that he was fit, and actually was sought out by coach Allegri for his “physique.” I’ll let you draw your own conclusions as to what that is all about. However, the oft-carded but strong and hardworking midfielder was a breath of fresh air to a battered Milan squad, and he scored the opening goal of his debut match with Milan against Cesena, a 3-1 win over the Seahorses. He also scored a goal vs. Juventus, and scored the singular goal in a 1-0 win over Chievo recently. So that makes three two goals in 9 appearances for Milan, with 6 yellow cards. Not too bad for a loan deal. He has also been an important player for Ghana, playing for the U18 Black Starlets, and also 73 caps and 17 goals for the Black Stars. He was called up for the 2004 Olympic squad in Athens, but was sent home for disciplinary reasons, which caused a little spat between him and Ghana’s football federation, but he eventually apologized, and was able to represent Ghana in the 2006 World Cup. He was voted an All-Star when he played in the 2008 African Cup of Nations, while more disciplinary issues and controversy prevented him from playing in the 2010 AFCON. More apologies saw him reinstated for the 2010 World Cup, where he was once again expelled, and then reinstated with the help of team captain Stephan Appiah. He also represented Ghana this year at AFCON, which delayed his joining of Milan for a few weeks. Before you decide if he is more man or monster, quickly take a look at his personal life. 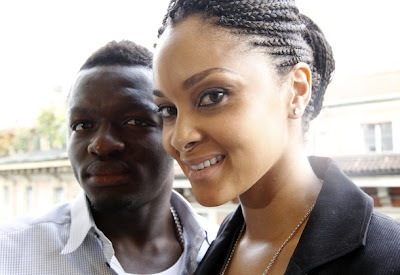 In 2010, he married former Miss Ghana Universe and fashion model, Menaye Donkor. Together, they run her charity, the Menaye Charity Foundation, which is the sole sponsor of a school for underprivileged children in Ghana. In addition to funding the buildings, teachers salaries, supplies, uniforms, etc., the foundation recently added a tech lab. The foundation also helps provide food and medical supplies to several orphanages for children with AIDS in Ghana. Respect. Sulley also has a cool website at sulleymuntari.com, where you can find out how to play video games against him, amongst other things. So… man or monster? Or maybe a little of both. While his inconsistency and poor disciplinary record on the pitch give him a bit of a monstrous reputation, it is clear that underneath the hothead and random killer goals is a man who likes to play football (and video games.) He works hard and is very passionate (read: hotheaded,) so fits right in at Milan. And he seems to come up with big goals when needed at least almost as often as he frustrates or gets sent off. He is committed to giving back to his country and giving children opportunities they wouldn’t have otherwise, which makes him just as lovable as the blue monster he shares his nickname with. Will he be renewed at Milan for next year? That is the question. I guess it depends a bit on whether or not Allegri is still impressed enough with his physique. Either way, he’s a good guy, and a player I would rather have playing for me than against me. Whether or not he is wearing the Rossoneri colors next season, I wish him the best with his career and his endeavors off the pitch, too.